My son, Jonathan, loves game-shows, and his current favourite is Deal or No Deal, the Australian version. It has been airing now for over ten years, and there is at least one episode available every weeknight on New Zealand television. I often watch it with him as it is a nice time to spend together. We discuss whether people should take the deal or not, and guess what the bank offer will be. There are other followers of the programme, equally devoted, and I am grateful to Paul Corfiatis and his mum who fastidiously collected data for all the 215 programmes in 2009 on the final takings, the case chosen and the case containing the $200,000. In this post I analyse this data, and give some ideas of how this can be used in teaching. You can find out ALL about Deal or No Deal on Wikipedia. I was excited to see our New Zealand radio gameshow, “The Money or the Bag” given as an antecedent. There are numerous incarnations of the game. The basic idea is that there are 26 cases, containing a range of money values from 50c to $200,000. The money values are randomly assigned and their allocation unknown to the contestant and the “banker”. The contestant chooses one of the cases, and chats to the host, Andrew O’Keefe, about what they will do with the money when they win. The usual responses are to have a big wedding or travel. As the programme is filmed in Melbourne, often second generation Australians are wanting to visit their parents’ homeland. Usually the contestant has a friend or family member as a podium player, who interacts as part of the banter. In the first round, the player chooses six cases to open, thus gaining information about the possible value in their case. At the end of the round, the banker offers a sum of money to buy back the case from the contestant, who must choose, “Deal” (take the money) or “No Deal”, keep the case and its contents. In the second round five cases are opened and then there is another bank offer. This continues until the sixth round, and from then the cases are opened one at a time, with an offer made after each one. The player either takes the deal at some point, or holds out until the end, at which point they take the contents of the case. There are other variants on this basic game, to add variety. My son is blind and has autism, and finds much to like about this programme. He likes the order of it all – every night, a very similar drama is played out, and he can understand exactly what is happening. He also likes the agony and the joy. He gets very excited when the case containing $200,000 is opened with the special sound effect, and Andrew says, “Oh No”. He likes hearing about the people, and their lives and he likes that you never know how much you might win. I also like the drama and the joy, but I’d rather not watch when it is going badly. I like it because it is an insight into people’s perceptions of chance. Like many people, I yell at the screen, telling them to take the deal when we see them being reckless, but I am usually happy when their foolish decisions turn out well. To me it is a true reality show – not because the situation is in any way like reality, but because the people are authentic in their responses. I have been known to weep when a nice person wins a sizeable amount of money. One day I would love to go on the show, as I know how much joy that would bring Jonathan, to be a part of it. Part of the appeal is the collective experience of it all. The podium players, the audience and the people at home feel connected to the main contestant. One episode that Jonathan loves to tell people about is with Josh Sharpe who was REALLY unlucky. He managed to lose all four top prizes in order at the beginning of the game. The probability calculation for Deal or No Deal is very simple. The contestant has one chance in twenty-six that their case contains the big prize. They have four chances in twenty-six that their case contains a prize of $50,000 or more. The expected value of their prize, if they hold onto their case to the end, is about $19,900 (valuing the car at $30,000). When the dealer makes an offer, it is often around the expected value of the remaining unopened cases. (The average amount left.) There are times when the offer is considerably lower or higher than the expected value, which seems to be in an effort to push the contestant one way or the other. Contestants very seldom take the deal in the early rounds of the game. What is the distribution of the actual outcomes for contestants? How often do contestants do better than what is in their case? Are there any “lucky” cases that contain the big prize more often than others? To explore these questions I am using the data so diligently collected by Paul Corfiatis. I will use data from games with the regular list of prizes, not “Fantastic Four”, which has some more high value cases. What is the actual outcome for the contestants? 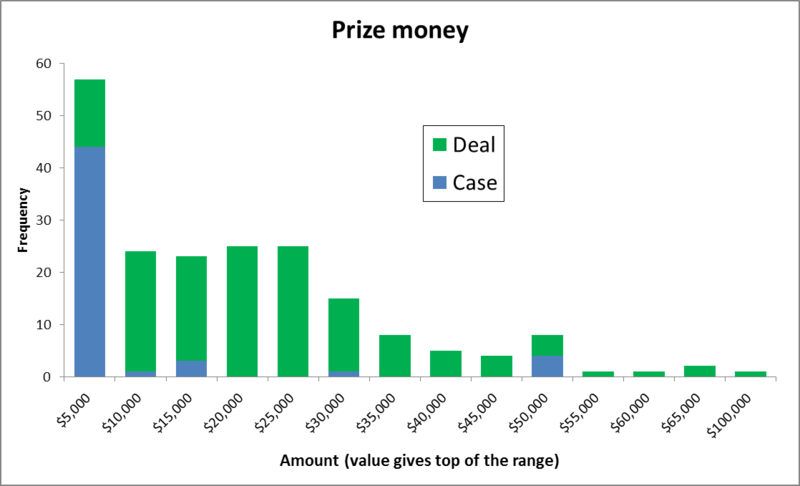 The following graph shows the amount of money the contestants win, either by taking the deal or hanging out for the case. You could have an interesting discussion about the factors to account for in looking at this. You would expect the mean to be lower for the “case” prizes, as they tend to be people who have kept going to the bitter end. There is a very large standard deviation. For this I calculated the prize less the amount that was in their case. The mean value was $1082, with a median of $9969.50, minimum of -$170,050 and a maximum of $99,995. Contestants who took the deal, did better, 106 times out of 146, or 73% of the time. And of course the one to make the statisticians smile – are there any lucky cases? 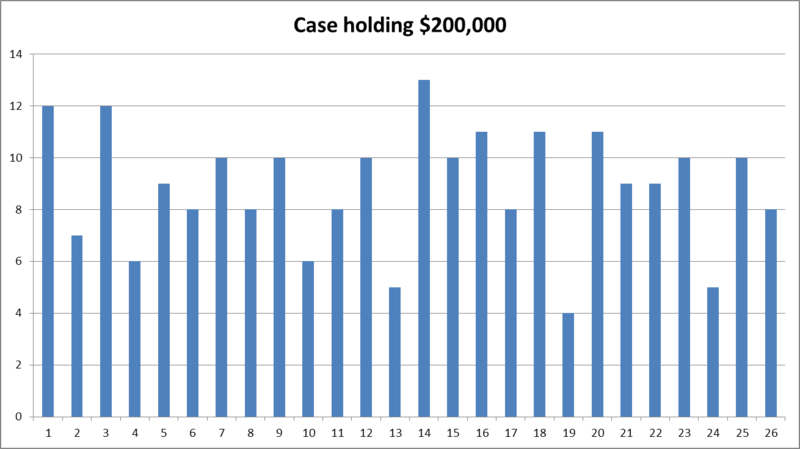 Here is a graph of the distribution of cases that held the $200,000. I am tempted to make glib comments about how clearly 14 is a lucky case, so you should pick that one, but then, maybe you should pick 19, as it hasn’t had the $200,000 much. But as you never know who is going to quote you, I’d better not. Which case contained the $200,000 in 2007. Depending on how much you wish to torment your students, and the educational objectives, you could give them the raw data, as provided on the site, and see what they come up with. Or you could simply present the results given in this post, watch an episode, and discuss what meanings people could take from the data, and what misconceptions might occur. 1.Has the Australian version of Deal or No Deal been on in NZ for ten years? 2. I know there was a New Zealand version in 2077-2009 I think. Did this version use the Australian music? Do you know where I can view a version of the New Zealand show? Thanks for your interesting probability calculations too. Thanks for your interesting questions. 1. No, it started 6 June 2005 on the Monday of Queen’s birthday weekend. They started a year behind, with the 2004 season. In the first year in Australia it was one hour, instead of 30 minutes. All the best, Nic, and Jonathan. Thanks very much for your kind reply. I appreciate this information enormously. Hi Dr Nic, I am a student teacher and looking for a way to teach Grade 6 kids about probability, specifically the misconceptions they might come across. I want to use Deal or No Deal as I think it will be a fun activity for the kids to enjoy. What misconceptions do you think Deal or No Deal involves? Would it be Representativeness? Hi. If you do a search on Deal or No Deal you will find there has been quite a lot written about it. There are several misconceptions. The Gambler’s fallacy, which I think is classed as representativeness, is one of them. One that really strikes me when I watch it, is that it is easier to picture winning than losing. I think that is called “availability”. It seems to me that it is very easy in the heat of the moment for the contestant to imagine himself or herself winning the money, and Andrew helps with that by talking about what they will do with the money. Because the image is so vivid, it gives it a perception of greater probability than is correct. There is also a certain amount of anchoring. Once a higher offer has been made, it is difficult to move and accept a lower offer. This is not one of the Kahnemann heuristics, but I think there is also the aspect that taking the deal ends the game and is somehow “letting the side down”. Many contestants apologise for taking the deal, rather than rejoice at their prize. I love the clip of the unluckiest contestant. You could possibly even have a version of Deal or No Deal in the class, using sweets or other rewards. I’d love to hear how it goes. I know you have moved on to dragons and such. But I wanted to let you know that I’m doing a “Deal or No Deal” activity with my students over their break coming up. I tried one back when this first appeared, but it went poorly. I hadn’t designed it very well and the students were nonplused. It will be about 2 weeks before I start seeing results. I’m posting here as a way of holding myself accountable. I’ve gone public, so I have to step up my game. That is great to hear. Though my attention is focussed on Cats and Dragons right now, any kind of innovative maths and stats teaching has my vote. I am very keen to hear how it goes, and maybe you would like to write a guest post about it – even if it doesn’t do quite what you intended. It is always good to learn from each other. Just wondering if any results have been taken on any numbers out of the 26 that have never been picked by a contestant? In the data I have for 199 cases, every number has been picked at least twice. Cases 2 and 9 have been picked twice, and Cases 3 and 17 have both been picked sixteen times, followed by 8 and 5 which have been picked thirteen times each. I was watching Deal or No Deal and was thinking about the odds, ironically enough after I left the casino where I played the slot machine version of the show. I wanted to understand how possibly improbable the numbers picked varied from the stats. Ex:1) Chances of picking $1M on the first pick after choosing a lucky case and how many times it’s happened. 2) How often a top 5 value case is opened as stages progress vs probability of doing so. 3) The “houses” overall advantage of contestant’s offer vs current probability they’re holding the highest value prize. I’m not a stats guy but if the raw data is available I would like to give it a whack.